Faculty members of the art department nominated Meadows for the illustration job. She, along with other Tech art majors, was interviewed by the publisher and author Aimee Aryal. “Although I had never drawn the Hokie Bird before, I had done campus scenes and knew this would be an incredible opportunity,” Meadows said. She created a sample watercolor of the Hokie Bird along with a portfolio of campus paintings, which she presented to Aryal. The next day Meadows was notified she had the illustration job. As soon as final exams were over in May, Meadows began working on the book. Trips were made back to the campus in order to photograph buildings as accurate illustration guides. 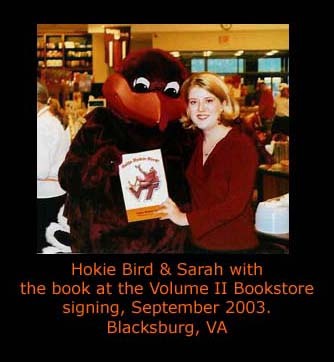 The Hokie Bird was drawn from Meadows’ imagination, but had to stay within the University’s guidelines for appearance. The book even involved painting Coach Frank Beamer. “Every little detail had to be just right,” Meadows explained. After three months of continuous labor, “Hello Hokie Bird!” was complete, and is now available in stores.